Happy hump day loves! It's so weird being back at work. Even though I technically was only "off" on Friday, it felt so long which I guess is a good thing! We hit horrible weather coming back from SC on Monday so we ended up crashing at Steven's friends house in Raleigh then finishing the drive Tuesday morning. I wish the weather had been nicer in Raleigh because I would have loved to see the area. Raleigh is one of the areas Steven and I are considering after he finishes his PhD next year! Linking up with Style Elixir, Mix & Match Fashion, and Walking in Memphis in High Heels! Cream casual cutie!!! Love this jacket to pieces!! So sorry about your weather, glad you're back safe and sound!! This blazer is perfect and such a classic piece! 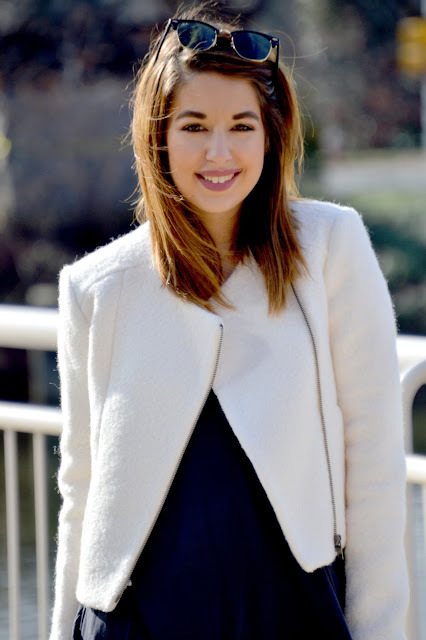 Love how you styled this blazer! The cut is so perfect! Loving this look! I'm always a fun of the peek-a-boo top sticking out from underneath a jacket! how amazing is that blazer/ jacket? I am obsessed with it! Such great styling here! Ahhh I love that blazer on you, Kelly! SO cute! Love this outfit because it's sort of a cross between business on top and party on the bottom with the ripped jeans! Love!! Love the cream blazer! So perfect over your long top, and I love how you paired it with the darker outfit. This cream jacket adds such an element of sophistication to your look - beautiful! I love the fit of this blazer!! This blazer is such a win! I love the cream colour and the cut is so crisp! The texture of that cream blazer looks gorgeous. Love its cut too. This cream blazer is so amazing! It can be styled so many ways, but I love it with the distressed black jeans! Beautiful blazer! I love the structure and color! You look absolutely beautiful, as always, Kelly! I love that blazer, which is super chic and stylish! It's definitely a versatile pieces that you can dress up and down and I adore how you've styled it here! I hope you're having a wonderful day so far, beauty, and thanks so much for sharing! So beautiful! I LOVE that blazer! You look so chic love! I love the jacket on you! Such a versatile staple. You are right that jacket is soooo cute! Perfect for the in between weather when it is only a bit cold. You look great.